The HD Barcode™ has revolutionized printed data density and has surpassed all other 2D codes in use today. HD Barcode can be configured to fit print constraints with simple adjustments to pixel thickness and line separation. Print your HD Barcode™ like other codes via inkjet or laser printer at ≥ 300dpi. A single HD Barcode™ can hold 175 times more data than traditional 2D barcodes allowing for comprehensive information in the form of text, images, HTML and Zip files. Using a proprietary reading application, authorized users can scan, read, and verify product details at any location. No Internet or database look-ups required! Unique HD Barcodes™ can be printed in the same manner as other codes such as DataMatrix, QR Code, and PDF417. With the use of a secure code generator, serialized HD Barcodes can be printed on the main product label containing match numeric values found in the DataMatrix or other code on the product carton. Authorized readers can scan both codes and confirm matching data is present. Traditional codes, such as DataMatrix and QR codes are limited in data capacity, are open source and require an Internet connection or database look-ups. HD Barcode™ has none of these shortcomings. Guarantee product authenticity by utilizing a proprietary HD Barcode™ with embedded security details that authorized personnel can obtain. List covert features such as location of micro dots, UV printing details, intended market and destination, or other data that is printed in obscure locations throughout the product’s packaging. Counterfeiters are not equipped with the ability to read this locked code. Therefore, counterfeiters will be unaware of the various security features throughout the product’s packaging making it easy for authorized users to identify discrepancies. Never second-guess your product’s authenticity again with HD Barcode™. In the event of an emergency, time is of the essence and having the right information available instantly could be lifesaving. 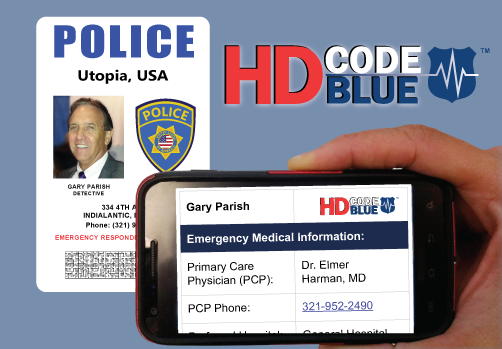 HD Code BlueTM can hold an immense amount of crucial data that can be accessed without the use of the Internet or database lookup, or even phone service..
All the information contained within the secure HD Code Blue can only be read by authorized personnel with access to the mobile Smartphone App. In the event of an emergency, time is of the essence and having the right information available instantly could be lifesaving. 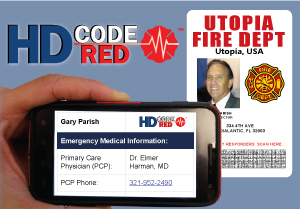 HD Code RedTM can hold an immense amount of crucial data that can be accessed without the use of the Internet or database lookup, or even phone service..
All the information contained within the secure HD Code Red can only be read by authorized personnel with access to the mobile Smartphone App. In the event of an emergency, time is of the essence and having the right information available could be lifesaving. 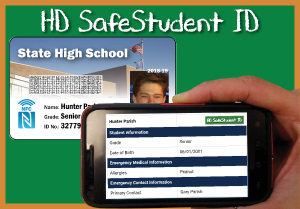 HD SafeStudent IDTM can hold an immense amount of crucial data that can be accessed instantly without relying on the Internet, database lookup, or even wireless connection. User friendly data entry program that generates encrypted HD Barcodes which can be decoded by authorized mobile devices without a database, Internet connection or wireless signal. 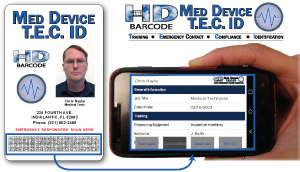 All the information contained within the secure HD Barcodes can only be read by authorized personnel with access to the mobile Smartphone App. HD Barcode LLC & Complete Inspection Systems, Inc.